About a year ago, I bought a couple of Codiaeum variegatum 'Gold-Dust'. I don't remember why, exactly: we had just cleared off a lot of space in front of the (south-facing) living room window, so maybe the logic was just that I had full sun, therefore, I needed some full-sun plants. I'm pretty sure that I knew that they could be difficult when I bought them. I think I'd even had them before, or something very similar. So I held my breath and crossed my fingers and brought them home. And then – anticlimax. I moved them up into 4-inch pots (I'd bought them in 3-inch), and after a period of adjustment, during which time I wound up moving them out of the window and next to a pretty intense fluorescent light, they did fine. Better than fine, actually. They grew pretty steadily, didn't drop any leaves, everything was good. Then around June things got to the point where they were a little overgrown, and I wanted to condense them. Two 4-inch pots don't take up a lot of room, maybe, but one 6-inch pot takes up even less. 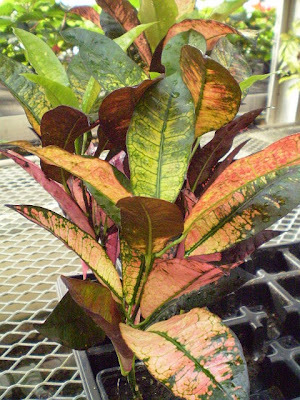 Plus they were doing so well already: I could have a really impressive-looking croton on my hands if I combined these, I thought. So I put them together. And it's been all downhill from there. About two-thirds of the leaves fell off. There were spider mites. New soil meant a new watering cycle, which I couldn't get the hang of: sometimes I would water them when they didn't need it, because I thought they did, and vice-versa. We are only just now beginning to pull out of this, and I'm not positive that the leaf-dropping and name-calling is over yet. The 'Gold-Dust' plants now. I know they don't look all that bad here, but they used to be so much fuller and happier. You'd weep, if I had pictures to show you, which I don't. So what happened? Not sure, but it was bad. So but anyway. I was impressed by these being unusual, and so I got one, and then I came back a short time later (the same day?) and got two more, also in 3-inch pots, and I potted the three together into a six-inch pot. And since then? They've dropped a ton of leaves. They've developed spider mites. I've had a tough time getting the watering schedule down. This crisis, unlike with 'Gold-Dust,' is ongoing. I have 'Andrew' in the south-facing living room window, and it's positioned such that I can't actually see the soil, so sometimes I forget to water it, which never makes it happy. This kind of experience is not all that unusual with crotons, though clearly I'm to blame for some of it. Repotting was, in retrospect, obviously a bad idea, though I'm a little hazy about why. We repot crotons all the time at work without tears and recriminations. But although there's blame to be assigned and accepted and so forth, I'm not really wanting to so much. I think we just need to walk away from one another1 and be done. She needs things I can never give her, like heat and humidity and super-consistent care; I need things from her that she can't give me, like a little co-operation when it comes to repotting, and resistance to spider mites. So it's probably best if we just separate now. Thank god we at least don't have any seedlings to worry about. On a less whimsical note: crotons are everywhere around here right now (mostly C. variegatum 'Petra,'2 which seems to have been the dominant cultivar for many years), because they're one of very few plants that have autumny-colored leaves, and this is autumn, so, you know, my employer's got a bunch, and the grocery stores around here have a bunch, and some of them are quite nice-looking. But they need heat and humidity, which you're not going to be able to provide in a centrally-heated home in the Upper Midwest for the next six or seven months, and even if you could, they're still one of the favorite meals for spider mites. They need a lot of light in order to maintain their color, they're heavy feeders, they'll drop a lot of leaves if you let them get dry, they're not easily propagated indoors or out3 and all in all they're just really not the right indoor plant for anybody, especially right now. 'Gold-Dust,' my bad experiences notwithstanding, is possibly one of the less demanding varieties, especially if you don't try to repot it when it doesn't want to be repotted. 'Mrs. Iceton,' below, is the cultivar that I wish I could keep but will now never try: I think it's pretty. UPDATE: See also a picture of another weird cultivar with extremely narrow leaves at this post from December 2008. 'Gold-Dust,' 'Mrs. Iceton,' and 'Andrew:' my own photos. 4 And only a couple that are more trouble. i was seduced by a codiaeum that I got from my mother-in-law. it was part of an assortment of houseplants in one pot. it has the most beautiful red and black and green leaves. sure enough, it started dropping leaves like crazy no matter what I did. I've managed to slow that down a little by extreme babying in a very well-lit south-facing room (light coming from three large south facing windows and one sky light). I'm using a portable heater and a small humidifier which seem to be doing the trick. We'll see if I can keep it up. This is certainly my most challenging plant right now. Nice blog btw. 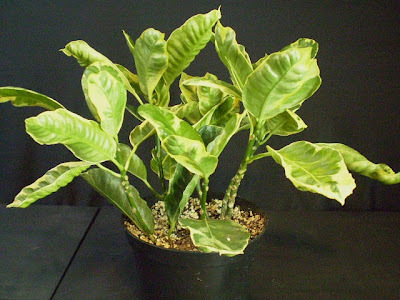 Came across it from the link you provided on my gardenweb question about your favorite easy houseplants. It's nice to see an intelligent perspective out there. Cheers! I just want to say that I agree with Jose about your "intelligent perspective." I think you should write a book because, not only do you have such an insight into plants and related topics, the quality of your writing is great too. You have the whole package! Now don't blush--it's not a compliment, it's a fact! Mine started to bloom these days! I have croton Mrs. Iceton. What a surprise! It's been in my home for more than 10 years. Any tips on telling these and Japanese Aucuba apart? Just discovered your blog. Terrific knowledge and the sense of humour a real bonus. Thanks! 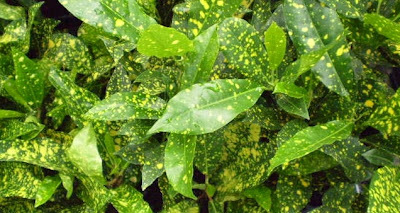 Well, I'm not positive about this, since I don't think I've ever seen an Aucuba in person, but I think Codiaeum leaves are smooth, and Aucuba leaves have serrated margins. Urgh. Mrs. Iceton should be called Evil Temptress. I won't be trying that one ever again. Ooo! So pretty! Why can't easy things be this pretty?! Or, maybe I should rephrase that as, why can't I take care of things this pretty? And the answer is I am forgetful and apathetic. But anyway, PRETTY! PRETTY! I almost wish I was less forgetful/apathetic about watering things so I could have me a pretty! I have 'Petra' or a similar variety. I started my craze for houseplants a few years ago with a red mangrove (deceased). My petra was one of my earliest houseplants, I bought a little plug one autumn for £1 and potted it up. Over the years I neglected it but it grew slowly and steadily, coping with irregular watering, dry air and a shady window. I am surprised it's near the top of your difficulty list because for me, it's my loyal houseplant along with my kentia. Last summer I watered it more than usual and it exploded in size and colour. Even when I neglected it it looked perfect! I'd urge anyone to give it a try; it really injects a tropical vibe into a room. I've heard the same from other people. If you have a spot the plant likes, and give it consistent care, they seem to be fine. 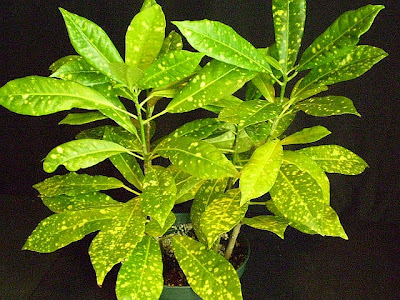 My problem is that there are always new plants coming in, so keeping a croton free of spider mites is beyond my abilities -- even when I'm very careful about checking the new plants first, I still wind up having to fight back mites occasionally. 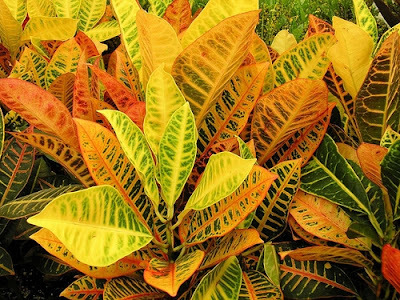 It's been long enough since my last croton that I might do better with one now, but there are enough other plants out there that it's not high on my list to buy. I've had a Codiaeum variegatum 'Petra' for 3-4 years and I can honestly say it has been my most reliable houseplant. I bought it as a tiny 50 pence plug cutting and now it's 2ft high. It's kept in my southwest facing living room and I water it about once a week. It grows steadily throughout the year, even during the dark British winter and will drop 2 leaves per year at the most. Unfortunately a few of weeks ago I went on holiday and didn't water it enough before I left... it didn't show any immediate signs of damage but a week later the crown wilted and it dropped two leaves (they were halfway down the stem, weird) in one go. Within a day it was back to normal, although it does look a bit strange now with a small gap of bare stem halfway down! We actually have Gold Dust growing on the side of the house in a very shady area with no care at all. I thought it was a weed at first but the hubby liked it so we ended up looking it up. Funny how some plants are hard for some people and easy for others. I think the difference is humidity. I see people saying "pounds" and "pence" so that leads me to believe they are in the UK which is a veritable temperate rainforest climate (just without all the trees). Also, those in muggy Florida have an easy time. My croton didn't last. I had always said "I'll never get a croton, I don't believe I'll be able to keep it alove" but one day the husband went to the plant store and brought home a huge purple waffle and a "bush on fire" which I have to admit I did think was super cool looking. The purple waffle is doing great, I even got two of its pinched ends to root (well, four but the two in the other spot in the pot failed randomly for I don't know why) and fill in the front of the pot after it was repotted. I also said I'd never have a purple waffle. I guess half success with plants I didn't want isn't too bad. And I think I'm quite fond of the purple waffle....we'll see how winter home climate treats our relationship.